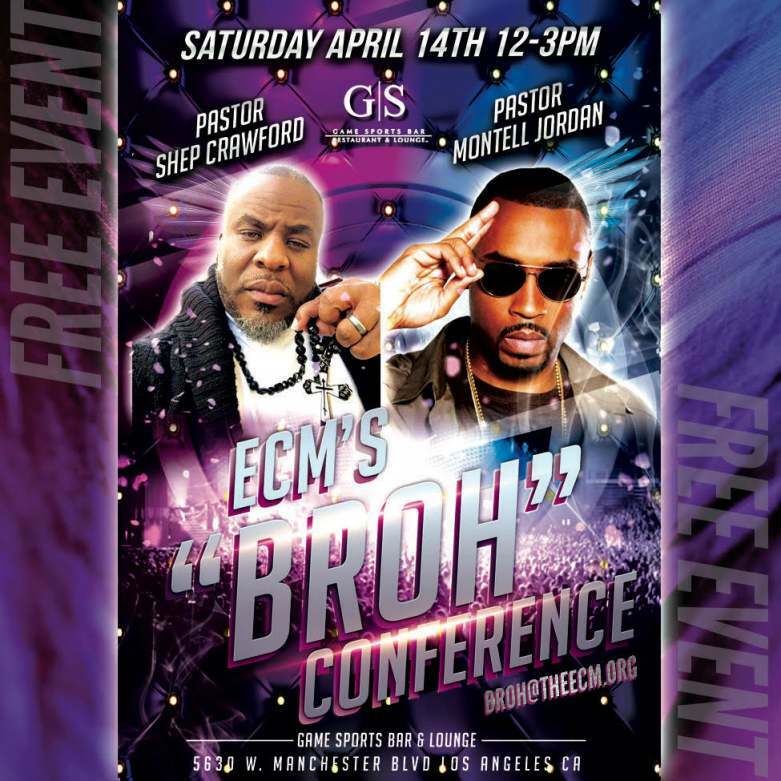 Grammy Award Winning Producer Shep Crawford and Hit Maker Recording Artist Montell Jordan Both Turned Pastors to Host the First Every Free "BROH Conference"
LOS ANGELES - April 11, 2018 - PRLog -- Grammy award winning producer Shep Crawford and Grammy nominated recording artist/producer Montell Jordan are back together again, but this time it's not in the studio. The two, who together worked on several R&B music projects over the years, have now become "Pastors". They will converge for the first ever men's only "BROH Conference" (Brothers Reclaiming Their Honor) on Saturday, April 14, 2018, from 12p.m. to 3:p.m. at the GS Sports Bar, Restaurant & Lounge in Los Angeles, CA. The cost of admission is a donation of a new or very gently used pair of shoes to be donated to the homeless on Skid Row. It is the goal of Pastor Shep to deliver 200 pairs of shoes. Pastor Shep's inspiration behind the creation of the "BROH Conference" (Brothers Reclaiming Our Honor) stems from him having been grieved by the increasing rise in broken marriages, broken households and the lack of male role models. It was his deep desire to do something that would uplift and restore the men. Pastor Shep thought the idea of a gathering for "men only" where they could come together and discuss these issues would be ideal. He then reached out to longtime friend, and former producing partner Montell Jordan to co-host the event. Jordan along with his wife of 24 years, Kristin Jordan, had co-authored a book under the same name as his number one Billboard chart topping hit "This is How We Do It". The book centers on the family and how to make your marriage last through the storms. Jordan will talk candidly about the issue of the Struggles of Lust and the consequences. Pastor Shep having been previously married and who recently celebrated 14 years of marriage to his 2nd wife will openly discuss the issue of divorce and the Bible, the pros and cons of a blended family and the mindset of the woman. The two have joined forces in an effort to help save and strengthen families and unions and form a brotherhood. The Conference will focus on the overall breakdown of the family and ways to prevent it. Pastor Shep will talk about the purpose and the important role of the man, and other temptations that can destroy the family. The conference is open to "men only" 18 and over, however, Dr. Shalonda Crawford will come in to speak on the topic of "Understanding Your Woman". The event will offer lunch, live entertainment and will conclude with an old fashion domino game. The AIDS Healthcare Foundation (AHF) has partnered with the Experience Christian Ministries and are a proud sponsor of the "BROH Conference" raising awareness and providing resources in the fight against HIV/AIDS. Shep Crawford is a well-known music producer who was recently featured on "Unsung" along with Deborah Cox and Montell Jordan. The powerhouse producing team wrote and produced the hit song "Nobody's Suppose to Be Here" that catapulted Deborah Cox's music career. The chart topping single is #5 on Billboards all time list of biggest R&B hits. Today, Shep Crawford is the Founder and Sr. Pastor of the Experience Christian Ministries in Los Angeles, CA, one of the fastest growing, community driven churches in South LA. Montell Jordan has had an explosive career in music with many high points, but none would prove higher than this. In 2011, Jordan took a job as a praise leader and musical director at Victory World Church, a mega church in Norcross, GA; however, it wasn't long before he would find out that the job was actually a calling. Jordan would then take his musical talents and passion for saving lives to the forefront as he takes on the role of Pastor Montell. Jordan and Crawford attended the same church as youth and when Montell got his big break, he reached back to bring Shep Crawford on board. Crawford credits Jordan for his entry into the music business. Crawford would go on to write, produce and place over 100 songs and becoming a Grammy winner. Some of Crawford's hits include: Whitney Houston's "Same Script, Different Cast", Deborah Cox's "Nobody's Suppose to be Here", Tamia's "Stranger in My House", Sisqo's "Incomplete", Luther's "I'd Rather", Kelly Price's "As We Lay" and the "My Time" album to name a few. To learn more visit them at www.TheEcm.org. From the Creator of "Allah Made Me Funny!" The Experience Christian Ministries Presents the Musical Stage Play "Cindy: The Alternate Ending"